As 2017 slinks off the stage wiping from it’s jacket bits of rotten tomato, we prepare to usher in a new year full of promise and, of course, Atari games. The (root beer) taps are open. Let’s celebrate! And celebrate we do with Bally Midway’s 1983 root beer (*wink*) -slinging party TAPPER. Cheers! If you can, support the show financially on the Atari Bytes Patreon page. My 2017 year-in-review “GOODNIGHT, 2017!” is up at my oft-neglected blog here. 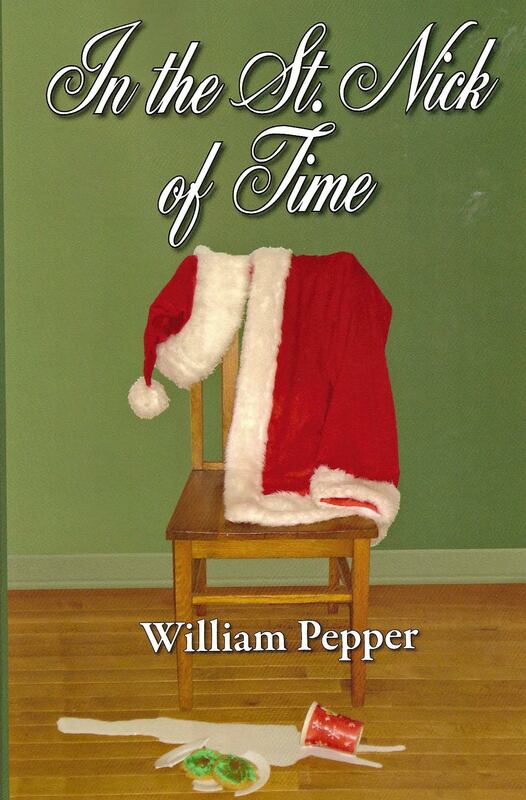 Don’t forget to please check out my book IN THE ST. NICK OF TIME, a sort of Santa Claus story for adults. It’s never too late to start on next year’s Christmas spirit. Egg the nog, yule the log and send Rudolph to guide Santa through the fog. It’s CHRISTMAS EVE! Oh, and it just happens to be episode 100 of this here podcast thingy. So what does all this mean for this week’s ATARI BYTES episode? I dunno. Let’s find out together! Happy holidays, everyone! Thanks to Kevin McLeod at Incompetech.com for creative commons use of his songs “Reformat”, “Take a Chance”, “Pinball Spring” and, this week, “Happy Happy Game Show”. Zazzle.com – pick up cool show merch in our store AB_Pod_Store. Atari Bytes Patreon – Our Patreon page is here. Consider supporting the show if you can. Here’s one of the places you can pick up my novel IN THE ST. NICK OF TIME, a sort of Santa Claus story for adults, ALL YEAR ‘ROUND! And if you’ve already bought the book, thanks! Don’t forget to go where you ordered it and leave a review! And, thus, REACTOR was born. But there was no way they were going to mix their chocolate and peanut butter. Some principles just can’t be compromised. My holiday novel IN THE ST. NICK OF TIME is still available. In fact, you can get this Santa Claus story for adult anytime! Click here for one of the places you can do that. And ten Earth-like planets, 40 light years away. And assault victims demanded no more saying “hush”. And all those who help others. And goodnight to the powerful, white men whispering “hush”. …With another episode. Number 98 to be specific. This week, in honor of the oncoming cinematic blockbuster STAR WARS EPISODE VIII: THE LAST JEDI, we’re playing the game based on episode II of the original Star Wars trilogy, which *actually* was episode V of the overall story. Hey, wake up. This is nerdery at it’s finest. Anyway, we’re playing STAR WARS: THE EMPIRE STRIKES BACK. Is it a good time or do we need the Force just to get through the thing? And by storming ice planet Hoth, what exactly are those AT AT’s playing at at? Here’s a place where you can pick up my novel IN THE ST. NICK OF TIME, a sort of Santa Claus novel for adults. Please consider helping with the production costs of this podcast by supporting the show financially on our Patreon page. Build a better mouse trap and the world will beat a path to your door. Well, that’s assuming they can find the door. It’s like a maze out here. Hasn’t anyone heard of Google Maps? This week on episode 97 we’re playing Exidy’s 1981 game MOUSE TRAP (Well, specifically we’re playing Coleco’s later Atari port of said game) and then we’ll dissect the motives of the titular mouse. Is it really all about the cheddar? Crowd around your podcaster apparatus to listen, but on your way grab a big, gooey bowl of cheese fondue and some delectable items to dip. Or a trowel with which to apply the cheese directly to your skin. You do you. Thanks to Kevin McLeod at Incompetech.com for creative commons use of his songs “Reformat”, “Take a Chance”, and “Pinball Spring”. Atari Bytes show notes, episodes, social media and more here. It’s a Podcast, Charlie Brown – Hey! That’s my other show. Go there for your Charlie Brown and Snoopy fix. It’s the holidays! Check out the t-shirts, mugs, tote bags, stickers and more at our absurdly named Zazzle.com store AB_Pod_Store here. If you can, consider supporting the show financially on our Patreon page here to help offset some of the web hosting and other costs. Thanks! Also, since the holidays are upon us, do please check out my novel IN THE ST. NICK OF TIME, a sort of Santa Claus story for adults. One of the places you can get it is here. Please do leave a review to help others find the book!